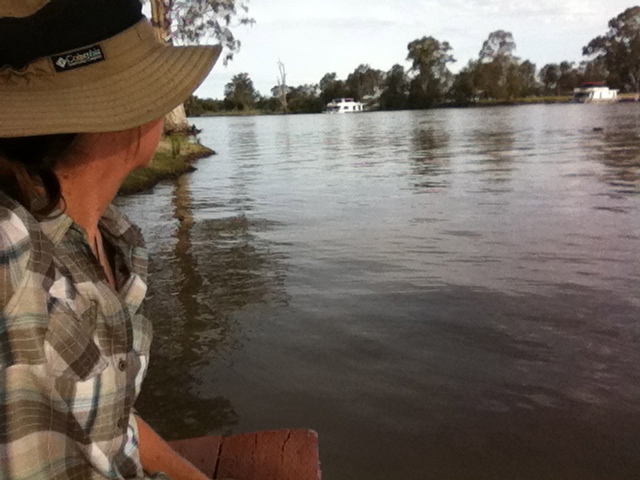 I did like Mildura. 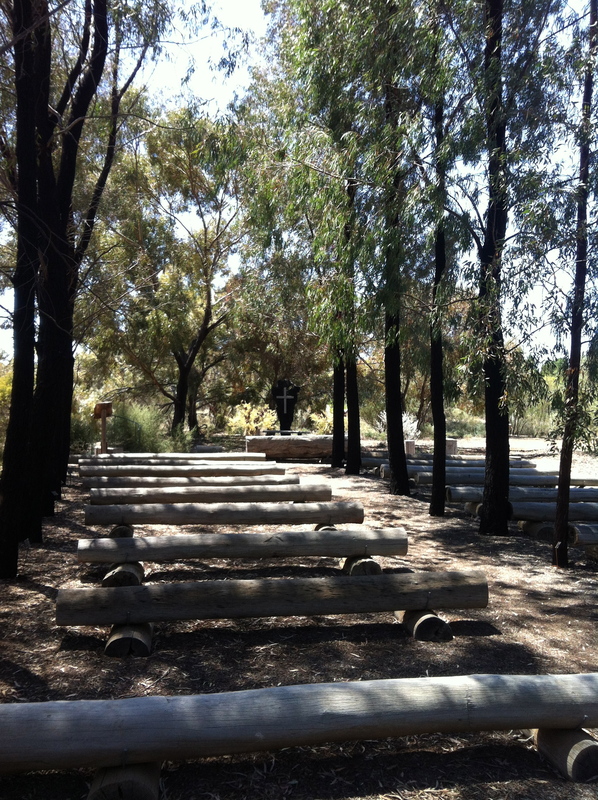 If the right job had come up I might have been happy to stay – I did have a preliminary interview with Mildura Tourism at the end of October and that felt borderline “right”. More to the point I guess, if my subsequent interview with the Gundagai Shire hadn’t dragged me 630kms to the east at the start of November for a job that felt was a whole lot more right for me, then I might still be in Mildura. But I have to admit, right now I am so glad I’m not! Yesterday the weather in central Victoria was disgusting. I felt like I was melting, roasting, baking, disintegrating. Yuk. But it was worse in Mildura, as it usually is from my observation so far. And while today we’re having a slightly cooler change, the heat is still on in Mildura and will be all week. No thanks. 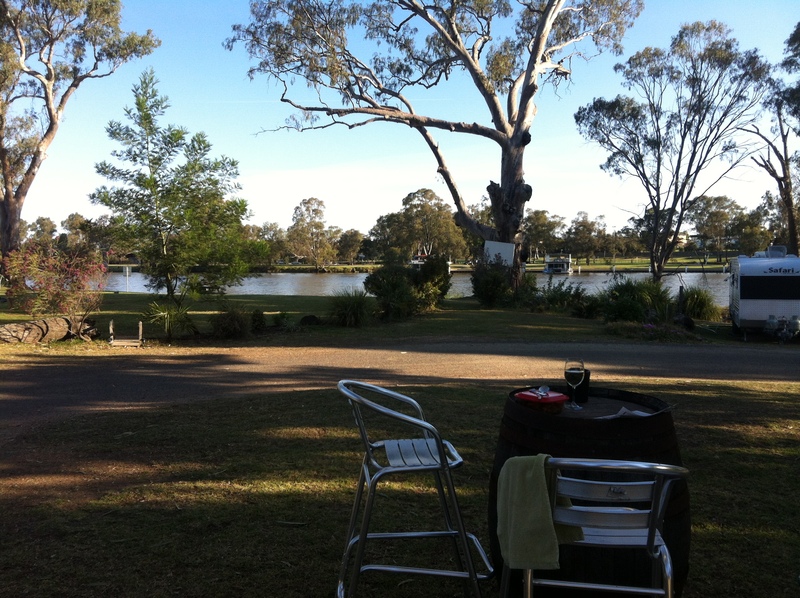 Even the Mighty Murray and the gorgeous Buronga Riverside Caravan Park (best of trip!) would struggle to keep me satisfied I think in the heat they’re getting. One of my motivations in leaving Geraldton and heading south was escaping the heat. So although this week I don’t feel entirely like I’ve succeeded I know it is temporary in this region, and I’m more likely to be shivering than melting! 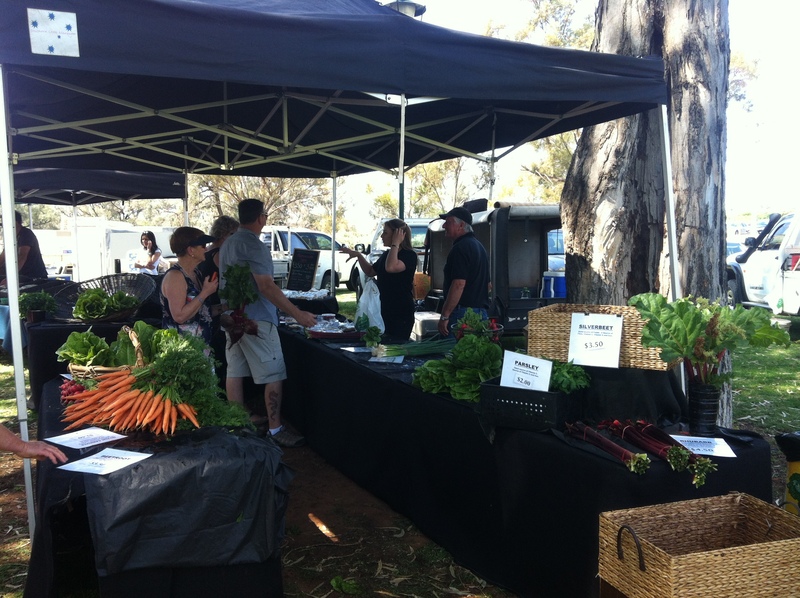 One of my favourite weekends whilst in Mildura started with checking out the Sunraysia Farmers Market one Saturday morning, in the beautiful gardens by the river – fantastic! I do miss that, as I haven’t seen any since to rival it. as usual I was late and the best stalls nearly empty! 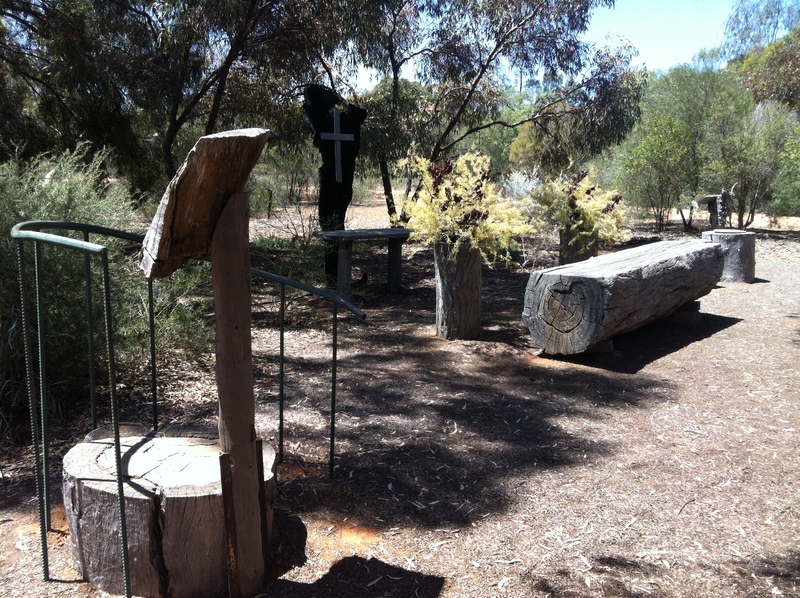 The next morning I cycled out to the Australian Inland Botanic Garden west of Buronga. 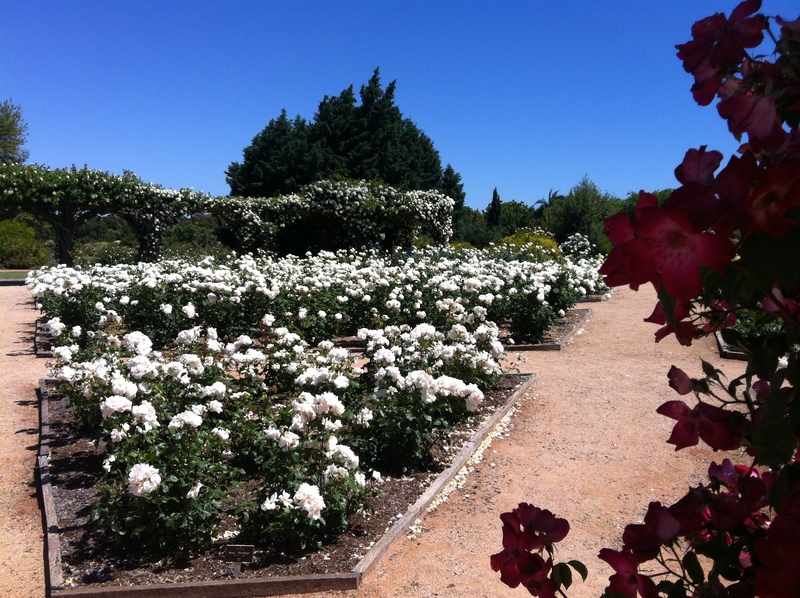 The Garden is gorgeous, and an extraordinary credit to the volunteers who made it happen, and who continue to drive its operations and development. It survives only on grants and donations, there isn’t even an entry charge. If I had stayed I’m sure I would have ended up joining in somehow. 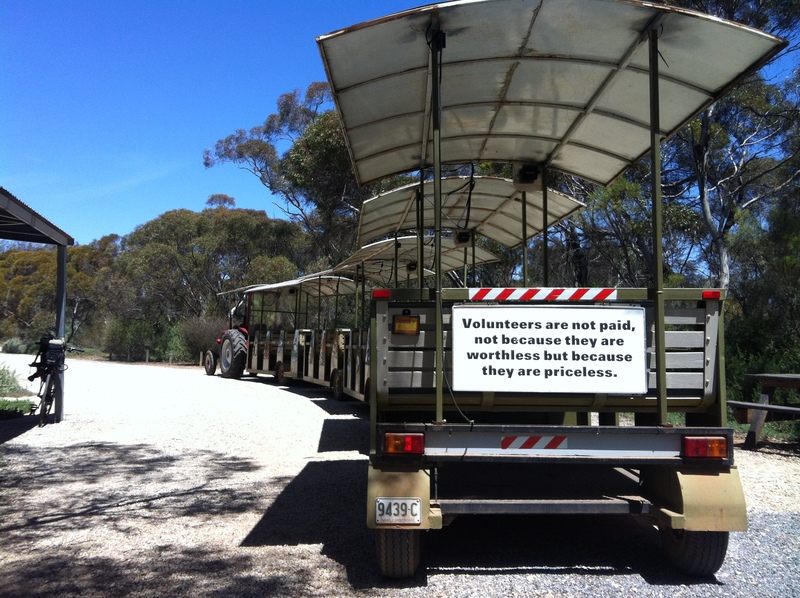 The AIBG is driven by volunteers – literally! 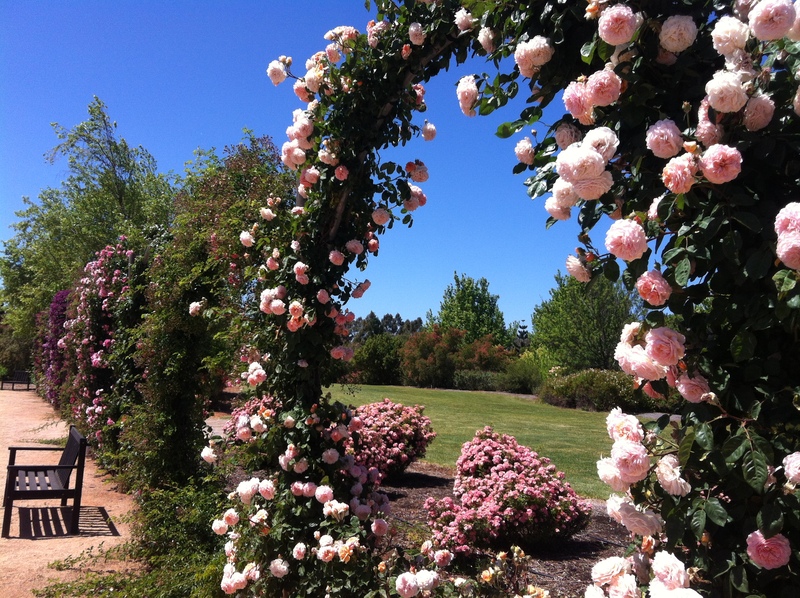 It started with a formal rose garden – gorgeously designed in blocks following a colour wheel surrounding by arcades covered by climbing roses, and a real pleasure to spend some time wondering through. I sat and read for a while, but it was a bit distracting! So I walked slowly in and through and around, smelling all the different varieties and attempting to take some worthy pics. The site has developed far beyond this original phase, and now includes a large number of themed areas, including American, Japanese, New Zealand, European, African, all different states of Australia and more. 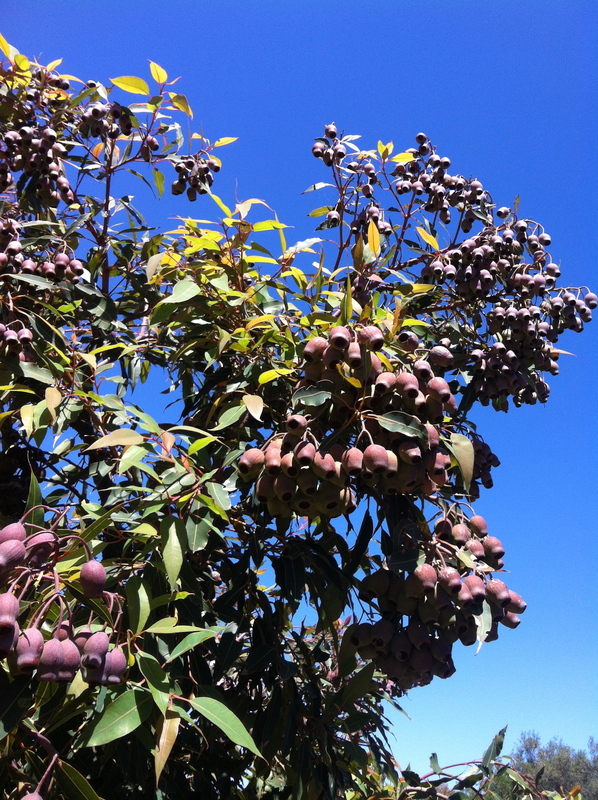 There is a 2,500 year old Eucalyptus tree, one of the crowning glories (but not very picturesque so I didn’t try to photograph it!). 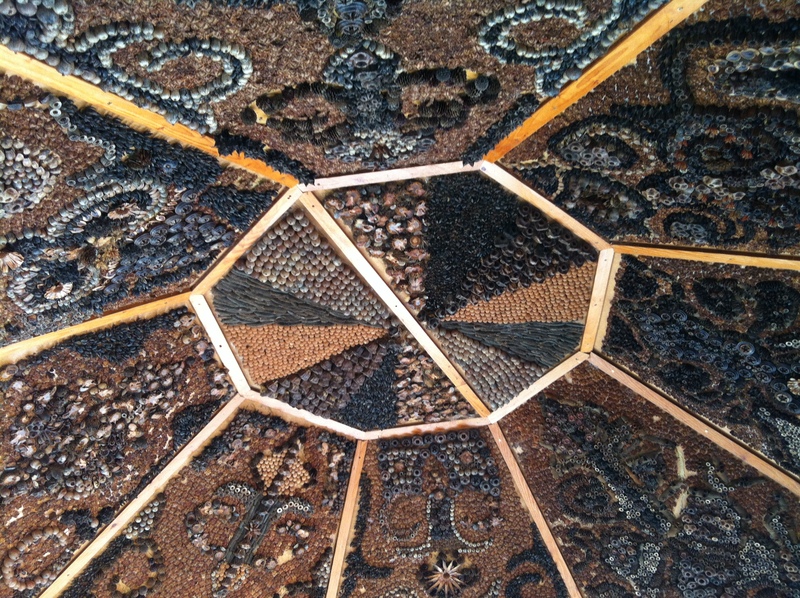 Many of the themed areas also include architecture representative of that region as shelters from the hot inland sun – African mud hut, European summer house, and the Australian summer house featuring an extraordinary mosaic style ceiling made entirely from seed pods. 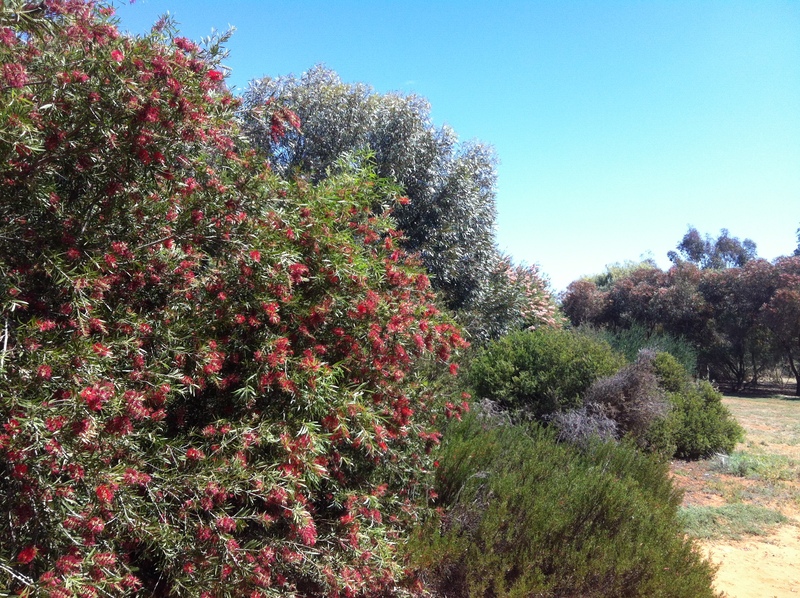 I’m probably still biased but the WA native garden was so gorgeous, by far the most captivating of the Australian natives – so many beautiful trees in flower and seed! They also have function areas within the garden including a captivating outdoor chapel – what a gorgeous place it would be to get married! Well worth a visit if you’re ever in the area, highly recommended by me anyway! 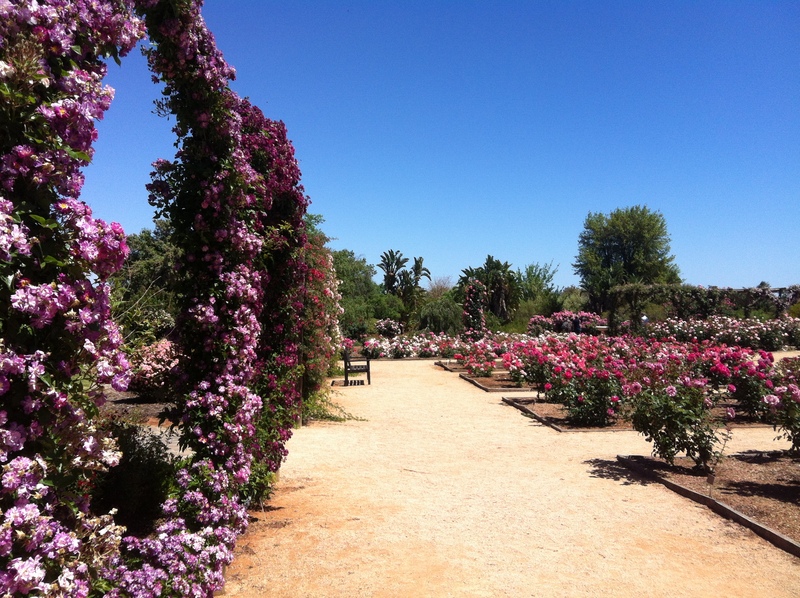 This entry was posted in Uncategorized and tagged Australian Inland Botanic Gardens, Buronga Riverside Caravan Park, Mildura, Sunraysia Farmers Market. Bookmark the permalink.